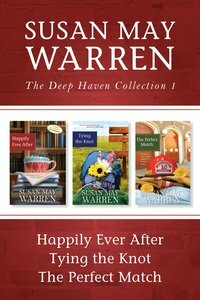 This collection bundles three volumes of Susan May Warren's popular Deep Haven series together in one e-book, for a great value! God has answered Mona Reynolds's prayers and given her the opportunity of a lifetime: she is about to open her own bookstore-coffee shop, the Footstep of Heaven. Now Mona has no time for love and no hope that a man can ever be the hero of her dreams. But when she hires mysterious drifter Joe Michaels to be her handyman, she discovers that it isn't only in fairy tales that people live "happily ever after." Ellie Karlson is new to Deep Haven. As the town's interim fire chief, she is determined to lead the local macho fire crew in spite of their misconceptions about her. But when someone begins setting deadly fires, Ellie faces the biggest challenge of her life. Especially when sparks fly with one of the volunteers on her crew: Pastor Dan Matthews. As Ellie battles to do her job and win the respect of her crew, she finds that there is one fire she can't fight-the one Dan has set in her heart. About "Collection #01: Happily Ever After, Tying the Knot, the Perfect Match (#01 in Deep Haven Collection Series)"